Join us on Saturday, May 11, 2019 from 2 p.m.-4:30 p.m. for an “Afternoon Tea with HDL.” This event will be held at the Brown Corners Church and is a fundraiser for the Harrison District Library Surrey House Renovation Project Fund. Tickets are $20.00 and are available at the Harrison District Library. Only a limited number of tickets are available so don’t miss out. Get your tickets early. The afternoon will include tasty sandwiches, delicious desserts and, of course, tea. Each guest will receive attentive service by her table host (Mother). The table Mother will be serving tea using her very own elegant table service. The Mothers will be competing for the most elegant table, so she will be working hard to earn your vote. The event will also include a fashion show. Guests will view a variety of fashions provided by Willow Classic Ladies Apparel in Clare and Midland. There will be a silent auction along with a large item raffle with all proceeds raised going to the Surrey House Renovation Project fund. Raffle tickets are available to purchase for $10.00 each. First prize is an overnight stay at the breathtaking Black Star Farms Inn in Suttons Bay (http://www.blackstarfarms.com/inn/) 2ndprize is an overnight stay at Riverwalk Place (https://www.riverwalkplace.net/) including an Oasis Escape spa package. 3rdPrize is a beautiful pair of Princess Diamond stud (pierced) earrings (.23ct). All silent auction items and raffle prizes will make a great Mother’s Day gift for the special mother in your life. So, get a ticket today for your mother, aunt, neighbor or friend and spend the afternoon with us. 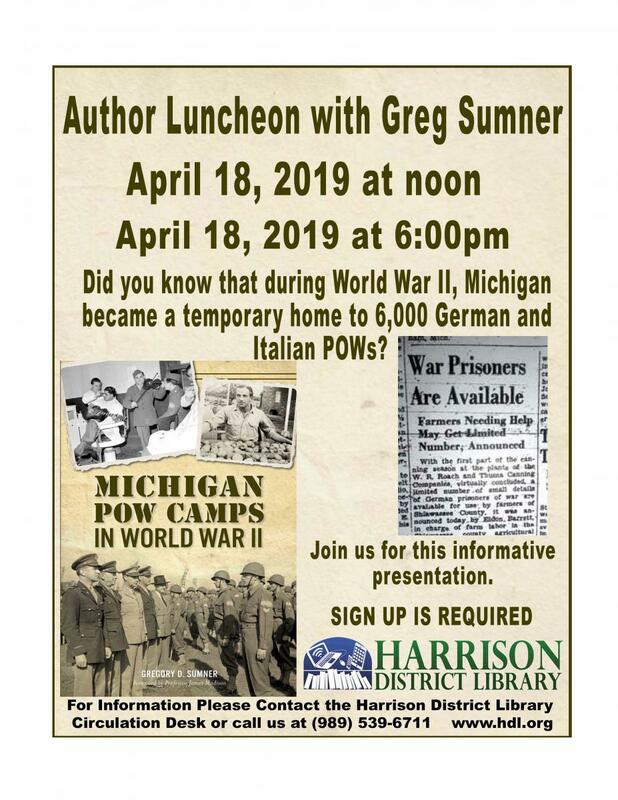 For more information please contact the Harrison District Library at 989-539-6711.